This week at Bead & Button, I shared some ideas for using bead soups and seed bead blends without doing any freeform stitching. Even if you’re working with a structured stitch, you can still get amazing, organic looking designs just by using a whole bunch of beads together. Thinking about some of my favorite custom bead soups reminded me of a packaged seed bead blend that I was once head over heels for. Way, way back when I first started bead weaving, I had two choices for bead shopping in town. One was a small indie craft store, and the other was a dollar store that stocked such nice things it was more like a boutique. And they carried Czech seed beads, which was incredibly awesome. Both stores sold their beads in tubes, and one SKU in particular was always in stock - much to my delight. The mix was called Earth, and included copper lined: transparent dark gray, crystal, Montana blue, mauve; and a gorgeous, stunning, copper lined green. If it weren’t for the metal lining, I would still be using that color today, because it is amazing. 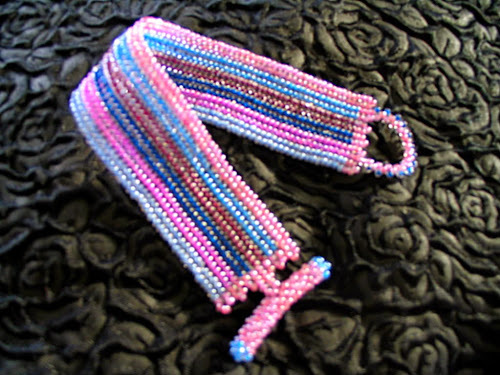 The mix that I liked also included color-lined crystal seed beads in Montana blue, pale blue, pink, and sometimes mauve. I’m a big fan of the color-lined crystal finish, and on occasion I used just the color-lined beads and left the rest of the mix for other projects. At some point, the recipe changed, and the color-lined beads were replaced with copper-lined blue and pink. 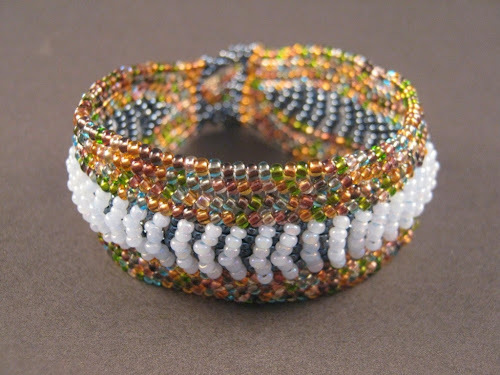 I lost access to this mix when both of the stores I shopped closed, and then I gave up using metal-lined seed beads. Even when I went back to ordering Czech seed beads online, I never thought to look this mix up and see if it was still available. It turns out you can still get the earth mix, but it doesn’t quite have that pop that I loved way back when. Do you have a favorite bead mix or blend? This week I’m experimenting with some different treatments for lovely 22 mm Czech dragonfly coins. I’ve got a selection of beads that I want to use, including Rullas and Miyuki drops. Luckily, I just happened to have some in nearly identical colors. I haven’t decided yet whether I’m going to use both my green and blue coins, or stick to just green. I’m definitely kicking myself for not purchasing more of the blue! With the right back up colors, both coins could look great in an alternating pattern, or with just one as a focal. Maybe asymmetrical. I’m going to have to play a bit and see what happens. I’ve also got a bunch of Java glass laid out in my workspace, drying after their water baths. I’ve got two more secret bracelet experiments coming up, which will revive and old favorite design. Eventually, I’ll also get around to stringing the last three embroidery pendants we made, so I can show you how they turned out. Sometimes when thinking up fun color palette trios, I’ve got a great theme in mind, or a great focal to experiment with. And sometimes, I just wing it. This month I wanted to make palettes for some new carved bone tubes with a natural finish. Instead of planning ahead, I just grabbed my seed bead trays and went with the first thing that came to mind. The first thing I spotted was a hank of lustered turquoise blue, which is a fantastic match for the bone beads. On a whim, I grabbed a strand of aqua white hearts, too. Rather than separate them and try for two palettes with light blue, I decided to use them together. What better way to show off a great neutral finish that with bright monochrome? Clear Skies is a palette that I can definitely see in a lot of different designs. Not only do the bone and turquoise look as if they were made for each other, but the glow of the white-hearts really plays nicely with the other blue. Together, they create a plain but interested backdrop for the bone beads, allowing the subtle shades of beige and brown to stand out clearly. I can see it in a multistrand design, or something with oodles of fringe. Next I went for greens, and combined two colors in the same finish. Transparent emerald and transparent lime are lush and lively, which really enhances the organic quality of the bone beads. Secret Meadow looks rather sophisticated, with its natural colors and perfect balance. It would make a great fall or spring palette, with just the right amount of warmth and light. I think this trio would look great in a symmetrical design, like an embellished cuff or beaded pendant. For the last palette, I switched out the roles a bit. Rather than two matched seed bead colors, I chose transparent dark topaz to go with the bone beads, and jet black for a contrast. Although we consider black to be a color that goes with everything, we often underestimate just how much black can change a palette. It can make other neutrals look lively, or bright colors seem serious and edgy. In Candlelit Study, the black provides a depth that makes the two browns seem perfectly aged. This palette definitely needs a classic design. Do you like to use monochrome palettes and elements in your designs? 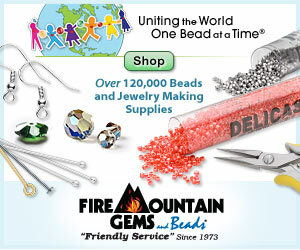 What makes a perfect bead store? The answer is certainly different for every beader, as we each have different needs and favorites depending on our style and the type of beading that we do. And just as there are many types of beaders, there are many kinds of bead stores, too. Naturally, some of them will be better than others. The city where I live has only two craft stores - one of them a big box chain - and no dedicated bead stores. This means that I have to shop for supplies online, which certainly provides a lot of choice, but not necessarily a lot of inspiration. The ability to browse, touch, and compare beads in person is invaluable. Two years ago I was able to visit bead stores in a nearby city, and I was a little surprised by what I found. One shop had a large selection of very basic beads from China, in a variety of materials. They also had lots of Czech seed beads, some Japanese seed beads, and a few unique odds and ends that were fun to browse. The second store was just a little bit smaller, but their selection was limited mostly to the generic Chinese imports - basic lampwork, metal charms, gemstones, and some bone. I didn’t think much about the selection that I found in these two stores until I made another trip this summer, and happened upon another tiny bead shop. I was really excited to browse, and perhaps find some unique focals and accents, plus top up some of my favorite seed bead colors. The selection that I found was confusing, to say the least. It would not be an exaggeration to say that it was almost identical to the second, smaller bead store that I visited on my last trip. It seemed as if the stores were both stocked from a kit, rather than selected by hand. I didn’t end up buying even a single bead - only a few met my picky criteria, and they weren’t exciting enough to make it worthwhile. I recognized a few of my favorite Czech seed bead colors, but when I looked for the ones I needed, I found that they looked generic up close. And without labels, I couldn’t be sure that they were of good quality. I was reluctant to ask because I had already inquired about 125 yard spools of Fireline - a curt “No” was the only answer I received. I couldn’t help but compare this store to the bigger one from my last trip. There, when I asked if they carried tagua, a polite “No” turned into a ten minute chat about natural beads. When I left the store I was disappointed and confused. I also found myself feeling rather annoyed. Even if I wasn’t so selective with the materials that I use, there weren’t very many offerings in the shop that would meet the standards of a seasoned beader. I thought about it for the rest of the day, and found myself wondering just what the purpose of a bead store like this could be. Whatever our origins in beading, it’s inevitable that we will be drawn to good quality materials. If we start out stringing cute plastic beads, it’s only natural to learn from our bead peers and beading books about artisan lampwork, Swarovski crystals, and good quality semiprecious stones. If we start out beadweaving with a premade palette of Indian or Taiwanese seed beads from the dollar store, eventually we’ll learn about Preciosa, Toho, and Delicas, and want to try them out. Considering the natural progression of a beader’s repertoire, is it likely that a store carrying beads, but none of the things that serious beaders want, is run by someone that doesn’t bead themselves? Why would anyone do that? The question that really made me ponder and puzzle was this: Who is supporting these stores, and what are they doing with the beads they buy? And if the customers eventually upgrade to higher quality materials, doesn’t that mean that the store will lose their business? If not for each new generation of crafters cutting their teeth on the cheap stuff, these bead stores would be totally unsustainable. Although it was several weeks ago, I still feel a bit steamed whenever I think about these two little bead shops with their uninspired and uninspiring selection. I can’t quite say why it bothers me in such a personal way, and it makes me feel like a bead snob - in a bad way. I can only hope that these shops will inspire bead novices to start the craft, and move up from there. I’d love to hear what you think! Do you have a favorite brick and mortar bead shop? What makes it special? Have you ever seen something that would be totally amazing, if only it were made from beads? When beading is your number one obsession, it’s hard not to think of beads wherever you go. And some things can inspire while also being a disappointment for their actual un-beadness. This happened to me just the other day. While on a family outing, we visited a shopping center that we haven’t been to in years, and found a nifty little bulk foods store. While browsing I turned a corner and was instantly transfixed by this display of sprinkles and dyed sugar. How gorgeous! The first thing that really catches the eye is the color blocked display in appealing ROYGBIV (actually, WPROYGBP, but close enough). Nothing beats a rainbow when you want to make something unanimously likeable. I sometimes find myself wanting to buy things that I don’t even like, just because they have a perfectly executed rainbow palette. Then there’s the fun factor - all those tasty things that go on other tasty things. It’s like seeing every birthday party plan ever made, all squished into one place. Then of course there’s the glittery quality of the sugars and sprinkles - a little bit of childlike magic that reminds us of simple pleasures. I smiled big when I saw these sprinkles. Then, even though there was never any doubt, I still became mildly annoyed that it wasn’t filled with beads. I’m sure if I was wild about cupcakes, it would have been pure bliss. I think my second reaction may actually be some lingering irritation about my last bead store trip. I’ll share the full story soon. In the meantime, let’s just enjoy these tasty colors, and pretend that they’re really bins full of beads! Today let’s travel back in time to the 1980’s, when more-is-more was the trend for jewelry. 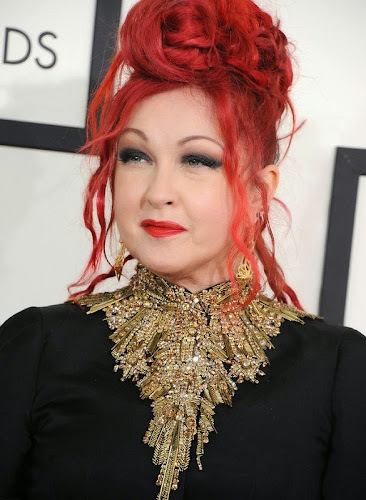 Two ladies who wore it best were Madonna and Cyndi Lauper. 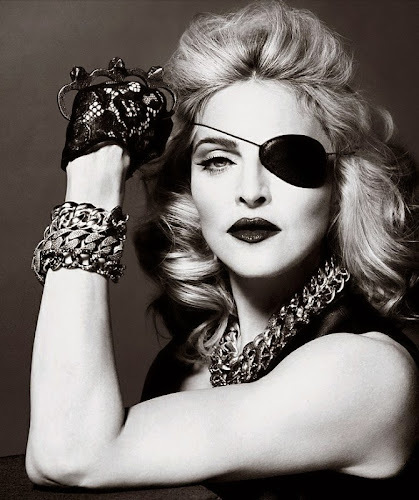 As iconic 80’s artists, they owned their bold styles, wrote now-classic feminist anthems, and inspired a generation of jewelry lovers to go wild. Some of the best 80’s jewelry trends that have returned of late include neons, layered bracelets, chunky chains, and mis-matched pieces. Pairing statement jewelry with casuals and incongruent accessories is also starting to make its way back - good news if you want to wear your biggest beadwork without dressing up! A few other things we still love are big, bold earrings (although the shapes have changed a lot) and beads, beads, beads! Who’s your favorite style icon of the past? The past week has been a very busy one at our house, with lots of work and plenty of fun summer activities. For the most part, I’ve had very little time for beading, and when I do I’m often too tired. You know you’re exhausted when beading is too much work. So, the necklace that I was hoping to start on a few days ago, and hoping to be finished by now, is only just under way. It’s already turning out great though. I really had a craving for black and yellow, so I decided to whip up a quick daisy collar. And since I didn’t want to skimp on the yellow, I reversed the colors and put the white at the center. I’m also putting a flower on every stitch, which at first I worried would look too busy. Instead, I think it will give the impression of a continuous chain of flowers, rather than a row of embellishments, since the background is so simple. I definitely wouldn’t want to have less yellow with spaced flowers. I’m also still working on a patterned cuff in black and golden yellow. It’s going much quicker than the prototype I made, which used Czech seed beads. I’d almost forgotten how much larger Japanese seed beads can be. The new bracelet will have far fewer rows and a bolder look than the first. It’s going to be a part of the top secret project, and it’s definitely a favorite so far. More on that in just a few short months! My favorite craft and beading books are those that focus on a love for weaving with seed beads, and using them with their full potential. It’s always a joy to look at tiny glass jewels transformed into beautiful structures, whether playfully or precisely. 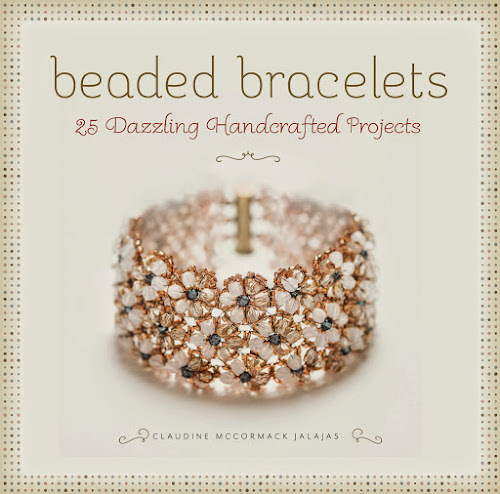 In her first beading book, Claudine McCormack Jalajas combines a love of jewelry design with a knack for seed bead weaving to create 25 gorgeous and wearable bracelets. Every piece combines techniques and materials in new ways - each different from the last - with styles to choose from that will suit every beader. There are geometric shapes, delicate florals, bold patterns, and plenty of embellishments. Beaded Bracelets includes a really straightforward and beginner-friendly basics section, with suggestions for choosing the best threads and needles for your projects, supplying the essential tools for a beginning beader’s workspace, and finding beads that will last. My favorite section in the book is the contents gallery, which showcases each of the projects up front, so readers can easily find a bracelet that inspires them. Each piece has a new combination of beads, stitches, and styles to try, for hours of delightful beadwork. The projects include step by step instructions and clear diagrams. Most of the bracelets are simple enough to make in one or two beading sessions, but look very elaborate. My favorite pieces include Melissa’s Honeybees with bold dagger bead flowers, and Sea Gold, with a trio of Swarovski Elements cosmic rings. Beaded Bracelets is a great book for new beaders, providing a variety of quick and wearable designs to try. 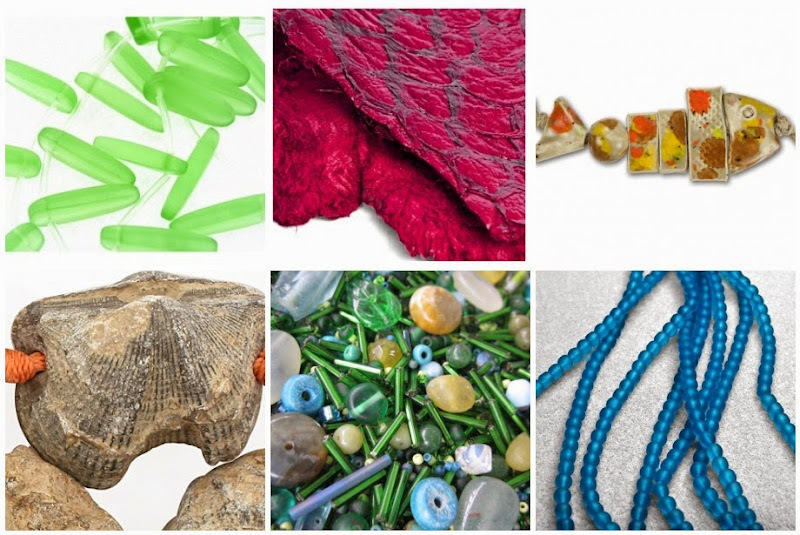 It’s also a great source of inspiration for using your favorite beads in new ways! I would like to thank Running Press for giving me the chance to enjoy Beaded Bracelets. Inspirational Beading has not received paid compensation for including the book in this blog post. I have shared my honest opinions about this book. The very first beading magazine that I ever purchased was the Bead & Button August 2006 issue. Just looking through the pages again I’m amazed at how much things have changed in my creative space. I was excited to try new techniques, explore jewelry design ideas, and learn more about the beads I was using - everything seemed new. At the time, many of the projects were intimidating, but I wasn't afraid to make adjustments to the instructions to bring them closer to my comfort and skill level. 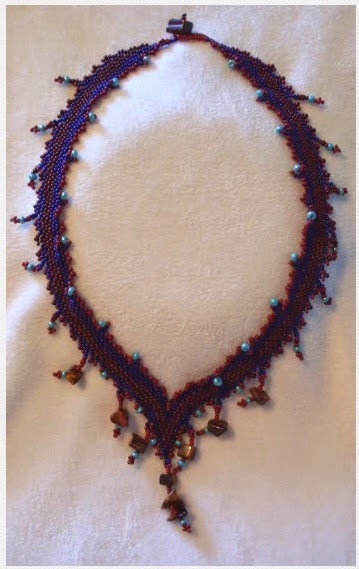 If I remember correctly, the very first magazine project I tried was the diagonal peyote necklace by Rebecca Peapples on page 68. The design was inspired by Bargello weaving, and featured carefully stitched peyote with drop beads and dangles. I made three variations using the materials that I had. Back then it seemed like I had all the time in the world to bead. Although peyote stitch is incredibly versatile, and able to morph into such interesting shapes, it never grew on me the way other stitches have. I learned a lot from this project, but I never had the desire to try the diagonal approach again. My other favorite projects from this issue include the fragrant beaded beads by Deni Whaley, Virginia Jensen’s loopy trimmed loom cuffs, and the shell donut necklace by Julia Gerlach. Do you remember your first beading magazine or book? So many good things are happening in my workspace right now, I don’t even know where to begin. I’ve just poured out three lovely Japanese seed bead colors in jet black and deep, deep shades of yellow for a new cuff bracelet. This one is going to have a pattern that I’ve been meaning to use for years. It’s another piece for my big project, which is getting closer to completion every week. I’m really looking forward to the big reveal. I haven’t pulled the colors yet, but I’m also planning a new daisy chain collar with black and yellow. I’ve been seeing the combination a lot lately, especially on Polyvore, and I couldn’t resist using it in a quick project. I suppose it might be the fact that summer is about to end, but I’m craving some bright colors and contrasts. I’ll be starting the new collar as soon as our dove embroidery pendant is done. I love the colors that my little designer has picked for this one (I’m secretly hoping for one more round of lemon lime). I was working on a freeform piece with baroque pearls on the side, but the beadwork came out too tight and all wonky, so I’m turning it into a necklace for myself, whenever I get around to finishing it. I’ve also got some new materials on the way that I can’t wait to try out. I’m planning a new stringing experiment and I think (hope!) that this one will turn out much better than the ones before it. I’m still trying to work out what I’m going to do with all the sari silk I bought. It’s good to take a break from life for awhile, especially if you ever start to feel like beading is like work. Even if beading is always the best part of your free time, sometimes it’s just nice to kick back. Lately I’ve been stealing a little veg time with virtual scuba diving via Wii Endless Ocean. I'm having a blast discovering lots of different tropical fish and mammals from the comfort of the couch. Of course, it’s impossible not to be inspired by the amazing colors, patterns, and shapes of a tropical reef, even if it’s only a digital one. So for this month’s mood board, I went on the search for jewelry and garments that would appeal to a South Pacific mermaid. Aquatic themes are among the easiest to create with beads. There’s an enormous variety of blues, greens, pinks, and oranges to choose from in every material imaginable. There are pearl, shell, and coral beads, beads shaped like fish and sea life, and plenty of techniques that evoke the feeling of an underwater realm. Combine any beads at all with coralling and the right colors, and you’ve got an instant tropical reef! Do you like to use ocean themes in your designs? What are you favorite materials to use? Sometimes really great relationships can result from blogging, and one of my all time favorites has been working with Artbeads.com. A few years ago I was a part of their blogging program, and they were a great help in aiding my budding bead repertoire. In December of 2009, Artbeads sent me some lovely cubic zirconia beads, and I had a great time incorporating them into my designs. I was a little on the fence about using them, with their relationship to gemstones, which is why I haven’t pursued them since. I did enjoy the unique colors and shapes, plus the hefty weight of the beads. 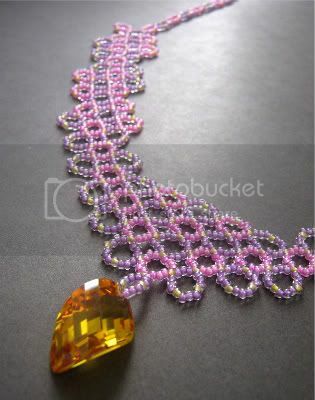 My favorite design was a bib necklace with soft and fruity seed beads in raspberry and wisteria, with a large honey-colored twisted oval cubic zirconia pendant. The color combination and the pattern of the beadwork were very pleasing. What I didn’t know as I was making it was that this necklace would bring me some very welcome criticism. About half of the off-blog comments I received on the piece were positive, while the others were not. I was a bit shocked at first, because it’s so rare to hear negative comments in the beading community. We love to encourage and compliment each other. Then I realized it was this break from the norm that made me love the comments so much. It was refreshing! I knew for certain that those who didn't like the piece were really taking the time to form an opinion on it, and that was a different kind of compliment. It's good to have a little salt with your sweet sometimes. Have you ever received negative comments about your work? How did you feel about the experience? This week I’m doing the multiple projects all at once thing again, and it’s actually a lot of fun. I've discovered that having more than one piece to work on means that if I get bored - but the official when-else-will -it-get-done beading time isn't over - I can switch to a different color and technique, instead of giving up and sneaking to the couch to read my book instead. So, in addition to a new patterned cuff experiment - which ended up with the exact same color palette as my last cuff bracelet, minus the black - I’m also working on two embroidery pendants. One is another experiment with wonky-drilled baroque pearls, which is turning out to be unusual and interesting. I’m sort of wishing that I’d left myself more room to add colors, because I’m sensing a rainbow effect coming on. The other pendant is one of my son’s designs. We started with a Czech glass dove oval, and a round of cobalt iris which looks decidedly purple. Next he chose rainbow lemon lime, which gives a nice contrast and looks great with the turquoise Picasso. I can’t wait to see what comes next! August is usually a great time of year for beading in my workspace, despite the sometimes unreasonable temperatures. Summer activities are winding down, and the rush of fall and winter obligations are not yet realized. This year things are a bit different as I divert so much attention to my top secret project, and it has also affected the beads that I’m turning to the most. One of the most exciting things in my stash right now is a new order from Happy Mango Beads. I haven’t had time to sort or store any of the new goodies, but every time I open my bead cupboard I see these three strands of white hearts peeking out of their temporary package and grin like mad. This time around I picked up some extra large yellows and some orange - I just need to find a little extra time to try them out! Druks are a huge staple in the designs I like to make, even if they’re just there for the clasps. I’ve had an entire storage tray dedicated to just druks for a couple of years now, and it’s never as full as I’d like. Right now I seem to be using druks so often that their numbers are dwindling even faster than usual. Druks of all sizes and colors are crossing my workspace - I’m particularly fond of the little 4mm ones, which are a lot cuter than the 6mm druks that I use all the time. I have been cultivating a large selection of brown and golden hued seed beads over the past year or so, and it’s getting to the point where I may have to divide them into light and dark shades, just to have enough room to store them in. Whatever the inspiration or theme, I always want to include one of these colors, and I just can’t get enough. Right now transparent medium topaz and brown iris are my go-to colors. They seem to be able to handle everything I want to do with them. What beads are you excited about right now?